However, the band reformed (officially they never split up), and the members started working on a new album. After finishing the first production, they were able to sign to one of my all-time favourite labels, Moribund Records. 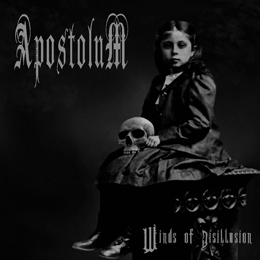 Winds Of Disillusion, which has a total running time of fifty six minutes (for six tracks), is the first result of this new co-operation. The album opens with a short intro (Light Into The Void), based on piano mainly, but it surely gives a first impression of what to expect. Unworthiness And Decay, the first ‘real’ song, brings a form of melancholic and bleak Dark Metal, melting funereal Doom-Death alike melodies with fatalistic and even surreal (does not mean: progressive!) Black Metal atmospheres. There’s a hint of (Scandinavian-inspired; with a focus on the Norwegian and Swedish scene) Post-Black-Rock melancholy at the one hand, and the famous Traditional UK-based Old School Doom-Death wave (the Dutch one comes to mind as well) at the other, and the duo incorporates elements from different other, related genres too, which includes the use of keyboards, grand piano, vocal samples and so on. But even I get sort of bored by this stuff. This album contains everything to surprise, but the total lack of initiative and having-balls makes this album reduced to a pulpy form of pseudo-nonsense. That’s sad, because there are some great ideas that, unfortunately, do not get performed the way they should deserve. Recommended if you would appreciate some mixture of, let’s say, Officium Triste, Katatonia, Satyricon, Empyrium, NovemberS Doom, Sear Bliss, Secrets Of The Moon, Alcest and Forgotten Tomb. But as suggested before: despite the nice intentions, the overall result is way too shallow and goody-goody.